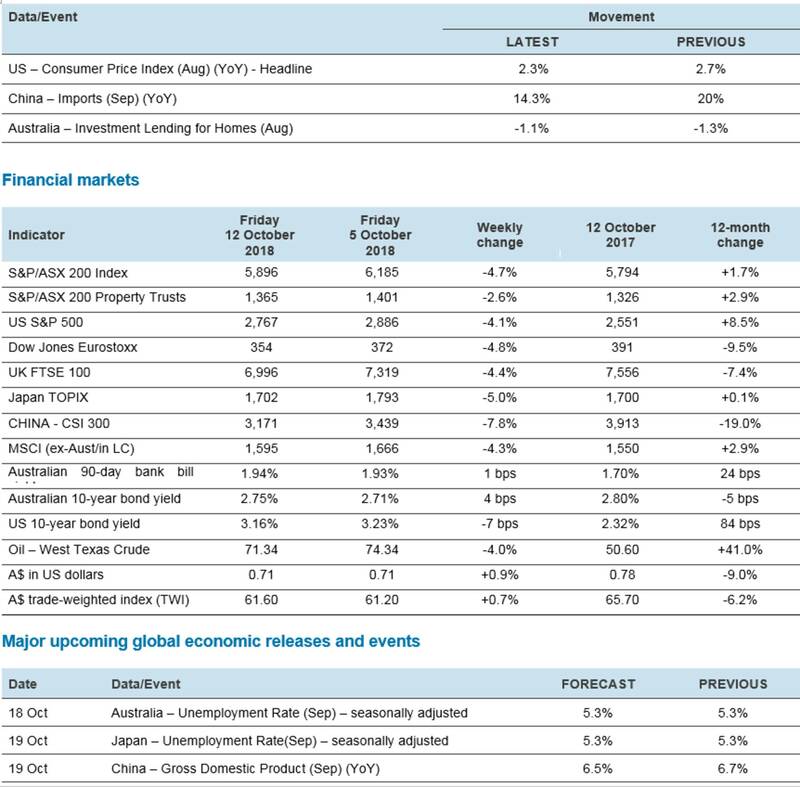 Despite a bounce on Friday from oversold levels, share markets fell sharply over the last week, led by the US share market primarily on the back of worries about rising interest rates and bond yields and the deteriorating US/China relationship. US shares lost 4.1%, Eurozone shares fell 4.8%, Japanese shares fell 4.6%, Chinese shares lost 7.8% and Australian shares fell 4.7%. Bond yields generally declined though, reflecting safe haven demand which also benefitted the gold price. Iron ore prices rose which is good for Australia, but the oil price fell. A fall in the US dollar saw the Australian dollar push back above US$0.71. It’s back – shares hit by another bout of volatility with likely more to go, even though it’s unlikely to be the start of a major bear market. Every so often shares go through rough patches. We saw this most recently in February on the back of US inflation and interest rate concerns, which saw US shares fall 10% and Australian shares down 6%. Shares managed to get through the seasonably weak months of August and September surprisingly well (except in Australia) but the worry list has pulled them back down again. So far shares have had a roundly 7% fall from recent highs. Given the ongoing worries around the US Federal Reserve (the Fed), inflation and bond yields, threats to tech stocks, the intensifying US/China conflict, rising oil prices, problems in the emerging world, the upcoming US mid-term elections, risks around President Trump and the Mueller inquiry and tensions in the Eurozone regarding the Italian budget, there could still be further weakness even though shares bounced from oversold levels on Friday. And given the usual global contagion, most major share markets including the Australian share market will continue to be affected. However, we doubt it’s the start of a major bear market because history tells us that they invariably require a US recession and with US monetary conditions still far from tight, fiscal stimulus still impacting and no signs of the excess (in terms of overinvestment, debt growth, etc) that normally precedes a recession, a US recession still looks a long way off. In turn, suggests that the trend in earnings and hence share markets is likely to remain up, beyond the near-term pull back. Has the Fed “gone crazy” and “out of control” as Trump has claimed? No – in fact it has been very responsible in raising rates back towards more normal levels because economic conditions justified it, but doing so in a gradual manner because inflation has been benign. That said, Fed Chair Powell’s comments that seemed to swing from leaning dovish and channelling 1990’s Alan Greenspan just a few weeks ago to sound more hawkish recently may have confused things a bit, when it reality nothing was really changing. While Trump’s regular criticism of Fed rate hikes won’t stop them from doing what is necessary for the economy, there is a risk that he will blame the Fed for the next inevitable downturn and this may threaten its independence. And history tells us that when politicians control central banks the job is done badly. At least there was some good news on the US/China trade front, with the US Treasury Department reportedly advising that China is not manipulating the Renminbi and with some reports that Trump and Xi have agreed to meet at the November G20 summit. In terms of the former, the Renminbi does not meet all the US Treasury criteria to be defined as being “manipulated” – yes China has a large bilateral trade surplus with the US, but its overall current account surplus is small and so too is its foreign exchange intervention. The Renminbi has been falling for the same reason the A$ has, that is, tightening monetary policy in the US relative to China. And in terms of the latter, talk is better than no talk, but it remains to be seen whether Trump and Xi will achieve a breakthrough given the extent of US complaints against Chinese policies. Jair Bolsonaro’s strong showing in the first round of the Brazilian presidential election points to a likely victory in the final round which would be positive for Brazilian assets in the short term but maybe not in the long term. A right-wing Bolsonaro presidency and a right-wing Congress as appears likely would boost business confidence and allow pro-business policies like corporate tax cuts and reduced regulation. But as a populist he is unlikely to do much about Brazil’s high public debt and unsustainable pensions. Bolsonaro’s anti-democratic stance is also a concern. So, while there may be a short-term boost for Brazil, long term problems will likely remain. US economic activity data was light on, but small business optimism remained around historic highs in September with employee compensation also very strong and jobless claims remain ultra-low. Meanwhile, producer price and consumer price inflation came in weaker than expected in September, with the core CPI stuck at 2.2% year-on-year and consistent with the core private consumption deflator running around 1.9% year-on-year, which is just below the Fed’s inflation target. This is all consistent with the Fed continuing to raise rates but only gradually, i.e. every three months. In Japan, machine orders rose solidly and an economic conditions index held up pretty well in September. China’s Caixin services conditions PMI rose in September consistent with the official non-manufacturing PMI, indicating that services sector strength may be partly offsetting manufacturing sector softness. Chinese imports and exports were solid in September with both up around 14% year-on-year, although some slowing is likely ahead. Meanwhile, the PBOC cut most banks required reserve ratios and a State Council meeting indicated a further step-up in stimulus measures. Australian business and consumer confidence rose slightly in September and October respectively, but both are well down on recent highs. Meanwhile, although housing starts fell in the June quarter consistent with a peaking in housing construction activity, work yet to be done is at a record high, three times above where it was in 2009 and telling us that there is still a lot of supply about to hit the softening homebuyer market. Housing finance also continued to slide. All of which is consistent with ongoing falls in home prices. The RBA’s latest Financial Stability review remained positive on global conditions – but does see risks around trade and low risk premia – and remains relatively sanguine about the risks around the slowing Australian housing market and household debt. However, it does acknowledge that some existing borrowers may have difficulty refinancing and that it’s possible (but not probable) that tightening lending standards will worsen the housing slowdown. 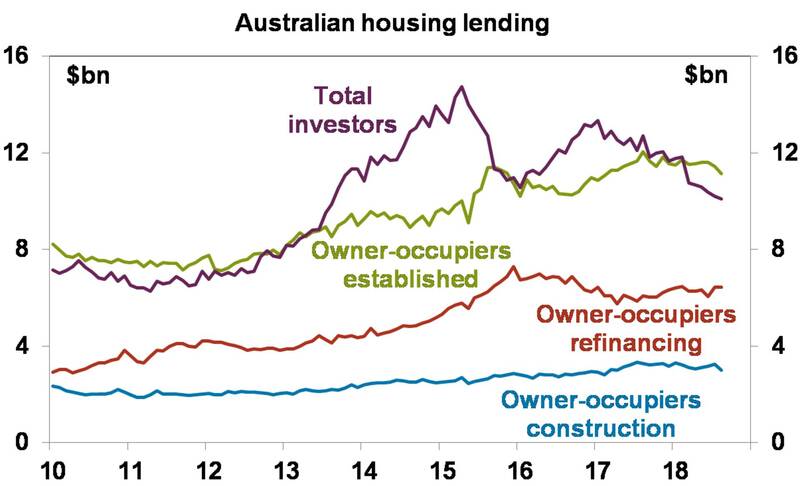 It is worth noting that despite all the talk about mortgage stress and foreclosures, the major banks non-performing loans remain very low, although they have been rising mainly in WA. In the US, September retail sales data to be released Monday is likely to show a decent gain, telling us that consumer spending remains strong supported by strong employment growth, rising wealth, tax cuts and high levels of confidence. In other data, industrial production is likely to see a modest rise, job openings and hiring are likely to remain strong and the home builders conditions index (all due Tuesday) is likely to remain strong, housing starts (Wednesday) are likely to fall back after a strong gain in August and existing home sales (Friday) are likely to fall slightly. The manufacturing conditions surveys will also be released for the New York and Philadelphia regions. Meanwhile, the minutes from the Fed’s last meeting (Wednesday) will reiterate that it remains on track for gradual interest rate hikes, ultimately taking the Fed Funds rate to above “neutral.” The September quarter earnings season will hot up, with the consensus expecting profit growth of 21% year-on-year, thanks to strong economic conditions and tax cuts. Corporate commentary around wages and tariffs will be watched closely. Japanese inflation data for September due Friday is likely to show a further rise in core inflation to 0.5% year-on-year, which is good news but still a long way from the 2% inflation target. Chinese economic activity data will be watched closely, given signs of a slowdown in response to last year’s credit tightening and US tariffs. Expect September quarter GDP data to be released Friday to slow down to 6.5% year-on-year (from 6.7% in the June quarter), industrial production growth for September to slow to 5.9% year-on-year but retail sales growth to hold at 9% and investment growth to pick up slightly to 5.5%. Meanwhile, inflation data to be released on Tuesday is likely to show a fall in producer price inflation to 3.6% year-on-year but a rise in consumer price inflation to 2.5%. In Australia, expect September labour market data due Thursday to show employment growth slowing to a gain of 10,000 after a surprise 44,000 gain in August but with unemployment remaining flat at 5.3%. Meanwhile, the minutes from the last RBA board meeting (Tuesday) are likely to show the RBA still expecting the next move in rates to be up, but seeing no case to move now and the by-election for the seat of Wentworth will be watched closely in regard to the Government’s narrow parliamentary majority. We continue to see the trend in shares remaining up as global growth remains solid, helping drive good earnings growth and monetary policy remains easy. However, the risk of a further short-term correction is high given the threats around trade, emerging market contagion, ongoing Fed rate hikes and rising bond yields, the Mueller inquiry, the US mid-term elections and Italian budget negotiations. Property price weakness and approaching election uncertainty add to the risks around Australian shares. Low but rising yields are likely to drive low returns from bonds, with Australian bonds outperforming global bonds as the RBA holds and the Fed hikes. While the A$ has now fallen close to our target of US$0.70 it likely still has more downside into the US$0.60s, as the gap between the RBA’s cash rate and the US Fed Funds rate pushes further into negative territory as the US economy booms relative to Australia. Being short the A$ remains a good hedge against things going wrong in the global economy.